When I first arrived on the Nashville restaurant scene, I remember learning of Tom Morales, owner of Tom Kats Catering. Tom found himself a very interesting niche catering movie sets all over the US and the world. He had his own kitchen on wheels and was able to go wherever the movie producers needed. His culinary empire has expanded, but the need for catering on movie sets, music video shoots, etc. still remains. Even if your town isn’t Hollywood, I’m betting there are commercials filmed and other arts related productions needing catering. About six years ago I introduced my newly divorced friend Dan to his now wife Jill. Jill now produces and acts in movies. Her production company, Sunset Beach Entertainment, just shot their first short film, Caroline, here in Nashville. At first Jill asked me to have a small non-speaking part. Then she found a small speaking part for me. Though I’m not at liberty to disclose details until the movie’s release, I was in three scenes. When I get the ok, I’ll post more pictures. 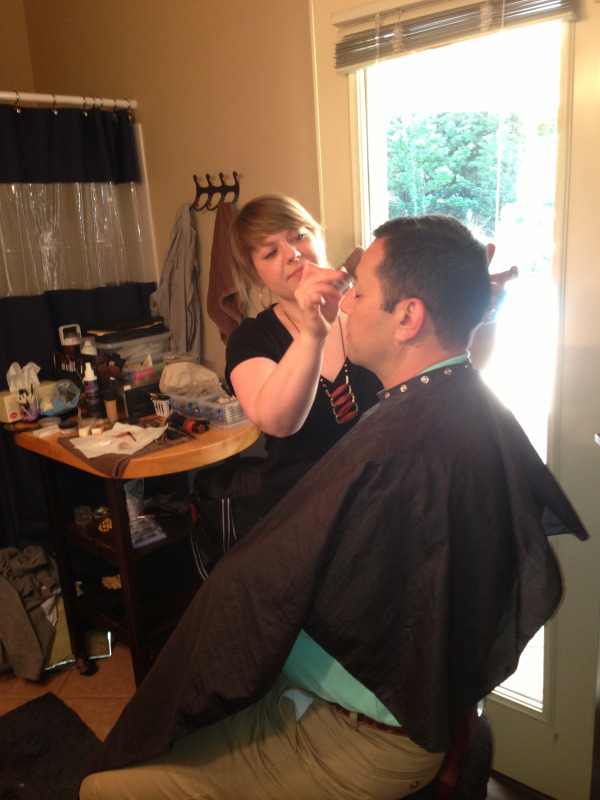 For now, you get to see me in the hair and make-up chair. My co-star in the scene was the wife of famous blue’s artist Keb’ Mo’. I made a hundred bucks for my part and I decided to frame the check as a memento. It’s on my bookshelf next to the forty bucks I won doing my first open mic night stand up comedy routine. Jill wants me for a larger role in her next film, a full featured pic. Maybe I’ll get my Screen Actor’s Guild card. Don’t worry. I’m not trading what I do for the allure of Hollywood. Though her production was very low budget compared to most movies, she must have spent a nice bit of money on craft services (catering as we call it). She hired a mobile food truck to serve breakfast to order each morning. They also dropped off lunch. It would be worth doing a little research to see if your state or city has a film commission. They may be able to turn you on to catering opportunities. Look up local video production companies and call to see if they use caterers. And don’t forget your local theatres. They’ll often cater in meals for patron parties and cast parties. You don’t need sunglasses, a riding crop and large megaphone to profit from show biz!